It provides detailed coverage of all exam topics and objectives, readily runnable code examples, programming exercises, extensive review questions, and a new mock exam. 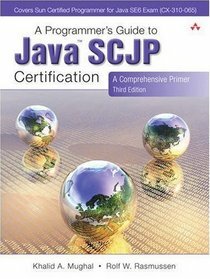 In addition, as a comprehensive primer to the Java programming language, this book is an invaluable reference tool. This new edition has been thoroughly updated to focus on the latest version of the exam (CX-310-065). In particular, it contains in-depth explanations of the language features. Their usage is illustrated by way of code scenarios, as required by the exam. The companion Web site (www.ii.uib.no/~khalid/pgjc3e/) contains a version of the SCJP 1.6 Exam Simulator developed by the authors. The site also contains the complete source code for all the book�s examples, as well as solutions to the programming exercises. Khalid A. Mughal is an Associate Professor at the Department of Informatics at the University of Bergen, Norway. Professor Mughal is responsible for designing and implementing various courses, which use Java, at the Department of Informatics. He is the principal author of the book, responsible for writing the material covering the Java topics.